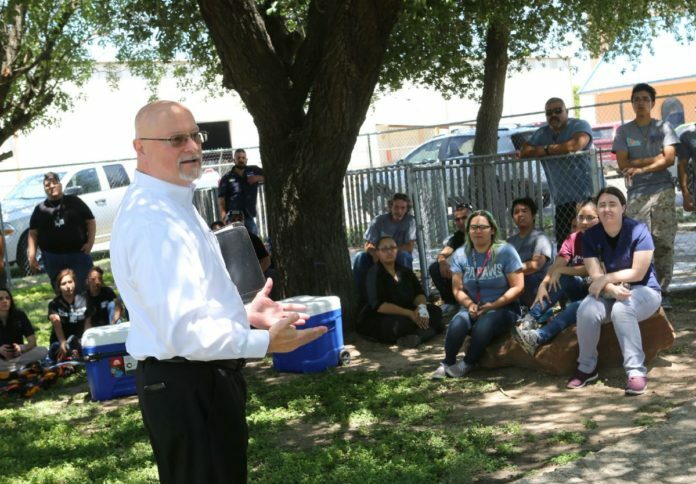 Tim Ousley, executive director of the Palm Valley Animal Center, tells staff members that the shelter will attempt to become a no-kill facility Friday, May 18, 2018, in McAllen. EDINBURG — The Palm Valley Animal Center announced Friday its intent to become a no-kill shelter, pledging to help save as many companion animals as possible as it moves forward. Tim Ousley, executive director for PVAC, made the announcement during a staff meeting Friday afternoon for both PVAC and its sister organization, the Laurie P. Andrews PAWS Center. The board of directors voted on the issue Tuesday, ushering a new era for the facilities. PVAC recently underwent major reforms after a video of the facility surfaced on the web and resulted in widespread criticism. But Ousley said the negative attention was not a determining factor in Tuesday’s decision. Still, the attention helped raise awareness for the community. “If it causes the public to become aware of what they need to do, then we’ll take the hits so that we can save the animals,” Ousley said. In the last five or six years, the organization has grown from about 37 employees to today’s 112. Before 2017, the live release rate at PVAC was around 10 percent, meaning 90 percent of animals faced euthanasia. Last year, PVAC posted a live-release rate of 35 percent, and so far this quarter, the center is at just over 50 percent. Achieving a no-kill status requires a live release rate of 90 percent or better, Ousley said. It’s still unknown how much more funding and manpower it will take to turn the shelter into a no-kill facility, but that’s something that will soon reveal itself, Ousley said.